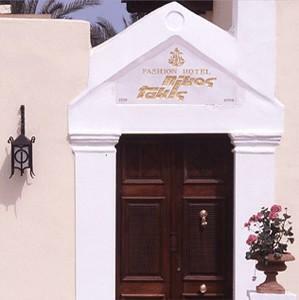 Nikos Takis Fashion Hotel is an unusual accommodation with a distinctly oriental ambience, thanks in great part to its high-end fashion decorations and use of color. The exterior of the building is in simple classic style of the 19th century, while the interiors have a unique style of their own. The excellent location of this boutique hotel puts you within steps of all of the sights of the old town. Hotel facilities are simple, and all guests share a lovely courtyard space, where a fresh breakfast is served daily. Accommodation includes three guest rooms and five suites. Room amenities include air conditioning, color satellite television with CD and DVD players, direct-dial telephone with ADSL Internet access, mini bar, safe box, and private bath with hairdryer, slippers and toiletries. The suites include bathrobes and Jacuzzi bathtubs, have a separate sitting area, and several have a private outdoor space. Furnishings and fabrics are all designer quality, and the highly stylized units offer comfortable accommodation, with eye-catching appeal. The hotel is situated in the old town, not far from the Great Magistrate's Palace.